Exploring Victoria (British Columbia) by foot is one of the most leisurely activities you can have, and I did that just recently. I walked around Government Street and explored Bastion Square, where the Maritime Museum of British Columbia is located. Slowly, but surely, through the 1890s until about 1912 Bastion Square developed as the legal and professional centre of Victoria and British Columbia. However, a depression in 1912, followed by World War I and Prohibition (1917-1920) began to weaken the economic base of Bastion Square and Old Town in general. The rapid growth of Vancouver as the principal port on the west coast drew many businessmen to the mainland. Gradually Victoria started to become a backwater and Bastion Square started to take on a shabby appearance. Without revenue from saloons, hotels such as the Burnes House were not viable. 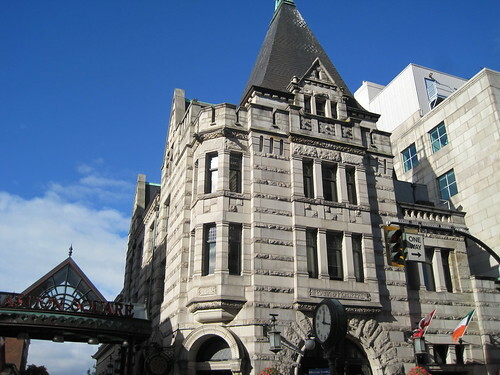 The Board of Trade Building lost its tycoons to Vancouver. These buildings became storage facilities for moving companies. The Hibben-Bone Block became a hotel, the notorious Churchill Hotel which had a beer parlour in the basement considered one of the roughest in town. Then in 1961 a new courthouse opened on Blanshard Street and the one in Bastion Square was abandoned. In many people’s minds, Bastion Square was ready for the wrecking ball and redevelopment. I have had lunch here (at The Local Kitchen, but that’s part of another blog post), and had a fantastic time. 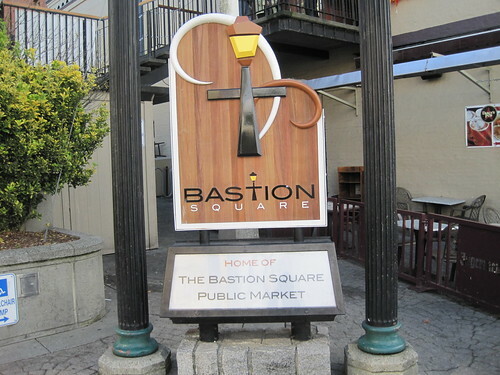 Bastion Square is definitely a gem of architecture and showcases awesome restaurants and pubs. I never get tired of hanging out here. 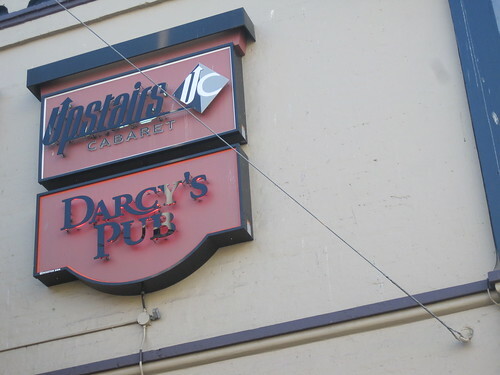 Haven’t been to Darcy’s in years. The last time was a rather memorable night spent with a few sailors…. I think I’ll leave that story there. I remember all these places; the Churchill was indeed notorious and there are many great stories about that place. I first went there in 1972 and I remember it was a busy street-level bar full of colourful characters. There was alot of fights that broke out but also a considerable amount of merryment. A little know fact – John Wayne (the actor) and his entourage were visiting Victoria during one of his many fishing trips to BC when he heard about the Churchill and decided to come in for a beer or two. As far as Darcy’s goes – I remember when it was a Spaghetti Restaurant called the Spaghetti Factory (not to be confused with the Spaghetti Foundry) as I worked there just one shift. I especially recall the nightclub above the restaurant named Harpo’s. Loved that place.